We were in Cumberland Gap when I got a message from an old acquaintance and blog follower. She’d seen my write-up about Sturbridge Village in Massachusetts and suggested we check out some of the Shaker community museums. 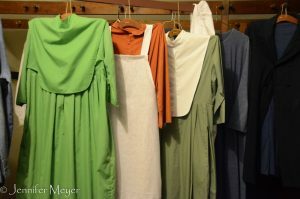 There was one near Lexington – Pleasant Hill Shaker Village – that she’d always wanted to go to. One of the things I love about blogging is the interaction, getting comments and suggestions. So I looked into this village thing, and it was actually quite fascinating. Even though we hadn’t intended to go north, we pointed ourselves in that direction just to check this out. 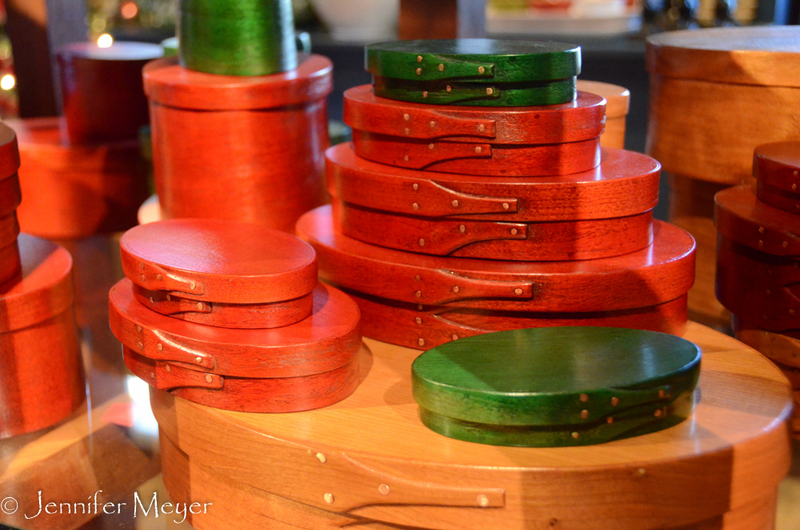 Shaker boxes in the gift store. I’d heard of Shakers but really didn’t know much about them. I knew they were a religious community in the 1800s. 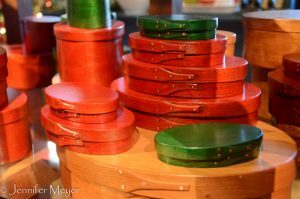 They made nice furniture and oval boxes. And one of my favorite old-time songs came from them. “’Tis the gift to be simple, ‘tis the gift to be free…” Yoyo Ma incorporated it in his performance for Obama’s first inauguration. What I didn’t know is that they were a communal society and vowed to celibacy. 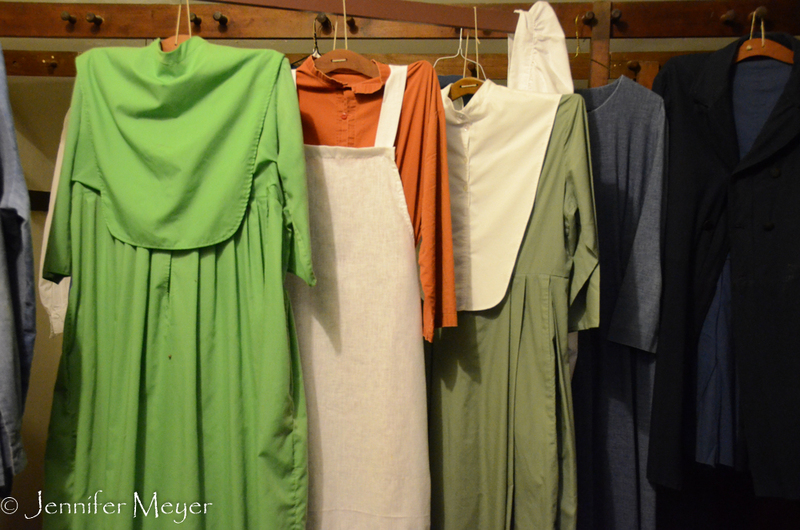 They lived as “brothers and sisters” in dormitories: one staircase for men, another for women. Without procreation, they relied on both converts and foundlings to continue the religion. All children, both those of new members and adopted children, were raised kibbutz-style in a separate building. They were extremely pious Christians, but unlike today’s Christian extremists, they strongly believed in pacifism and equality for all. They were abolitionists and included many freed slaves among their ranks. And women held equal rank in the community. They would not fight in the Civil War, but they fed and assisted any soldier who asked for help, either side. So much so that at the end of the war, their resources were nearly depleted. The Shakers were very successful in their endeavors. All that sexual energy was put to good use, I suppose, because they became known for quality in everything from produce to livestock to furniture. They were extremely inventive and came up with all sorts of contraptions and machines that were precursors to later inventions. They had washing machines, for example, that were powered by horses. An elevator in the barn that was used to lift hay. They worked with propagation to create hybrid plants, and they were one of the first in the country to package and sell seeds for gardening. The Shaker religion was started by a woman, Ann Lee, who was born in Manchester, England in 1736. As a youth in England, she joined the Wardley sect, a religious group that believed in celibacy and in the dramatic purging of sin. In spite of her vehement rejection of marriage and sexuality, she was forced into marriage by her father at age 19. She had four children who all died as infants, and she began to publicly advocate celibacy as the only true path to holiness. She was imprisoned several times for blasphemy and for dancing and shouting on the Sabbath. During one of her imprisonments, she claimed to have a vision that she was the second coming of Christ. To escape persecution, “Mother Ann” and her husband migrated to America in 1774, with several of her followers. Her husband abandoned her soon after, but she and the others eventually settled near Albany, New York, where they established the first Shaker community. Originally, they called themselves the United Society of Believers in Christ’s Second Appearing, but outsiders dubbed them “Shaking Quakers,” because of the frenetic dancing and shouting they used to “shake out their sin.” At some point, the group embraced the name meant as ridicule and called themselves Shakers. The Shaker Village that we visited was active from 1805 to 1910. Mid-century, it was a thriving, prosperous village. The Shakers were excellent farmers and livestock breeders. The made and sold brooms, along with seeds and produce. 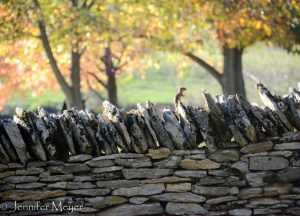 As they acquired adjacent farms and fields, they hired a single man to fence the land with stone walls. It took the man 12 years to finish the job, at a cost of $1,000 per mile. 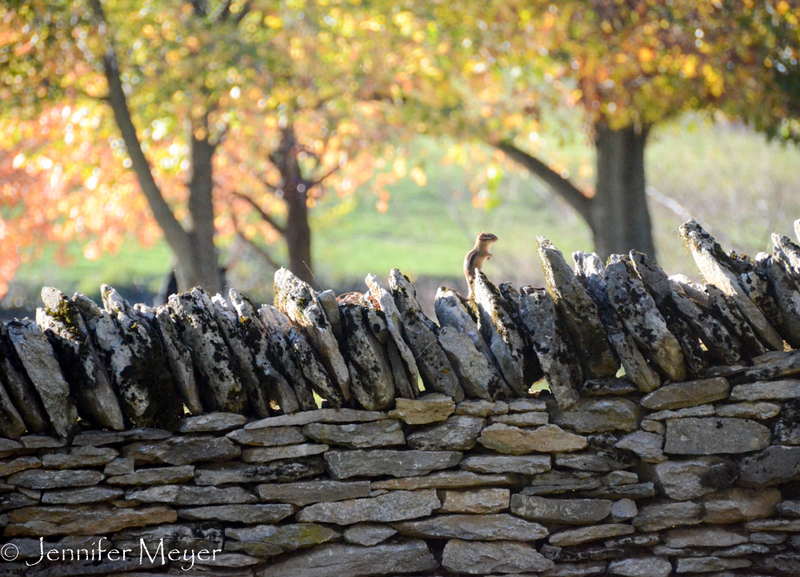 The fences still hold strong today. 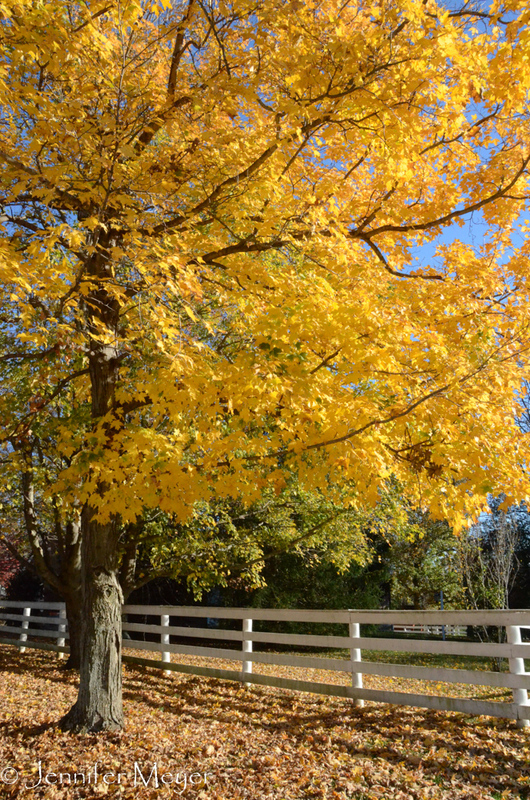 The day we visited, it was a beautiful sunny day, and the village trees still clung to their bright orange and yellow leaves. It was a Sunday and it seemed most of Lexington’s portrait photographers were posing families among the leaves. It was also Open Studio, so several artists had set up in various rooms of the old buildings. We loved exploring the museum and reading about the village’s history. 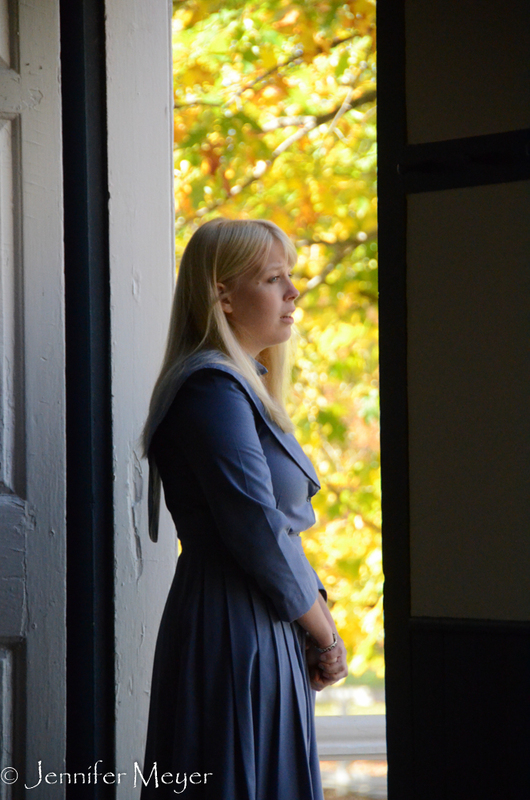 At one point a clear, haunting woman’s voice sang from the Meeting House doorway. She was a museum worker and music student, hired to give a talk and demonstration of Shaker music, dance, and worship. She had a beautiful voice that reverberated in the empty Meeting House, and I loved her description of Sunday gatherings in the Meeting House. Shakers preferred to experience God communally through song and dance. Every Sunday brothers and sisters gathered in the meeting hall, where they would sit quietly until someone felt moved to speak. Confessions were popular, or inspirations. When the Spirit moved someone, they would rise and sing spontaneously, sometimes in gibberish, which was believed to be “angels singing.” The community would join in as compelled, marching as a group, dancing and gesturing, singing together, usually working into a frenzy of stomping, shouting, and singing that could be heard miles away. They continued this way until they had “shaken the devil out.” Meetings could be as short as 15 minutes, if the Spirit wasn’t present, or last into the night. The longest held meeting at this particular village was 23 hours. 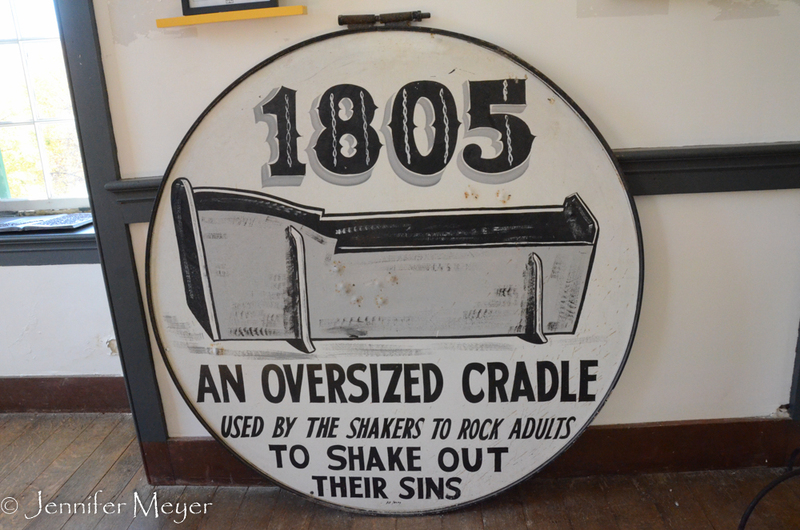 A community based on vowed celibacy has a hard time sustaining itself, and by 1900, only 34 Shakers remained. The village community was dissolved in 1910. That last surviving member, Mary Settles, lived to 1923. She witnessed women’s suffrage and planned to vote Democratic. She said women always had equal rights in their community. I don’t know how homosexuals were treated in Shaker communities, but I suspect that as long as they were celibate, it wasn’t an issue. Maybe gay and lesbian brothers and sisters had some extra shaking to do on Sunday mornings to rid themselves of “sinful” thoughts. I am that acquaintance and didn’t expect a mention. 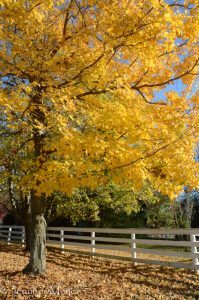 I must admit I had not kept up with all your posts and happen to look at your lovely Fall Season photos–a favorite time of year. So it was only by chance that I happen to see your wonderful picture of a woman and the barn at Sturbridge (a place Terri and I had been to years ago–a lovely MA living history village). Your photograph reminded me of a Vermeer painting subject and I had sent you a quick comment and at the same time realized you were in Kentucky. When I was traveling often for business on the East Coast, I became a real fan (can’t say follower) of the Shaker communities. Most of them are living museums and now National Heritage sites. I was fortunate to visit the last living community in Maine and really enjoyed visiting Canterbury Shaker Village in New Hampshire. 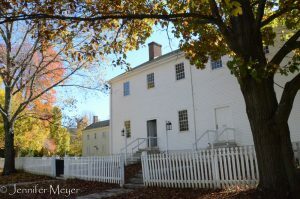 If you head back to the Northeast, there are plenty more to visit along the “Historic Shaker Trail” and they all are unique and wonderful places to visit.